Michael Hendrix works at the U.S. Department of the Treasury and is a Certified Fraud Examiner. At Treasury, Michael conducts investigations, writes analyses, and gets into the weeds of the Code of Federal Regulations. His day-to-day duties include “following the money,” “connecting the dots,” “untangling ownership,” and “asking the right questions.” Prior to joining the federal government, Michael oversaw the training program of a fast-growing due diligence firm, where he provided research expertise to over 100 employees in three countries. Michael holds an MA from Georgetown University’s School of Foreign Service and a BA from the University of Chicago. A long-time WIT fan, Michael has variously been a student, teacher, performer, and show director at the Washington Improv Theater. For over a decade, he’s witnessed firsthand how the art and play of improv draws out our creative tendencies and provides a special space to strengthen our better energies together. Michael Hendrix believes that humans do improv as naturally as we breathe, but for some reason we start holding our improv breath when we become adults. He's been dancing the wild jig of improv for over a decade. Michael spent 4 years in Chicago improvising with college troupe Occam’s Razor. Since moving to DC, he has performed in a wide variety of WIT productions, including the storytelling-focused show Lore, horror parody Die! Die! Die!, and romantic comedy Improv Actually, as well as with the ensemble King Bee and the Harold team Spirit Bear. 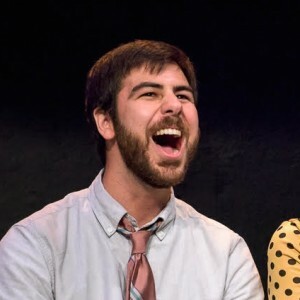 Michael has taught WIT classes, regularly performs as one half of the comedy duo Big No No, and in 2016 he created and directed the improvised drama Citizens’ Watch. Michael’s a big fan of all the imagination, spontaneity, and sincerity in improv. But the craft is hard to describe. It’s like A Framed Collage of The Best Mistakes. Or like A Reverse SOS From The Future Telling You You’re Gonna Be Fine, Go Eat Some Ice Cream. Or like A WhoDunnit Where Everyone Is The Detective and Everyone Is the Killer And It’s Tea Time, Cheers!